It was a homecoming months in the making for a family from New Jersey. 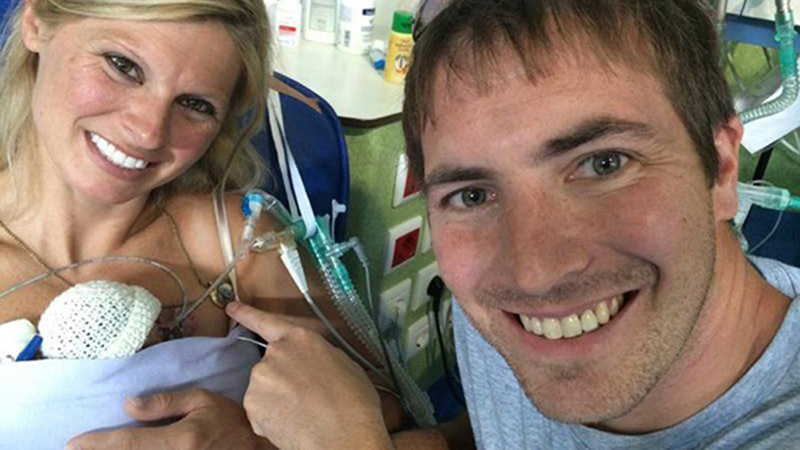 They were celebrating a "babymoon" overseas when the unexpected happened - the birth of twins. That quickly turned into a nightmare. Emotionally exhausted, Fred, his wife Kim, and baby girl Hayden are now back home. They touched down at Teterboro just after 2 p.m. Sunday after what could only be described as a life-altering experience. "We feel like we're coming home incomplete - we're happy to be home, but it does feel like there's a part that's missing," says Fred. Fred is talking about his son, Hudson - Hayden's twin, who died two weeks after the infants were born at a hospital in Portugal. Kim and Fred got the okay to head overseas for their babymoon back in May, but Kim went into labor, and the twins were born 13 weeks early. Hudson did not pull through, but Hayden was holding her own. "You could tell they had some highs, and a lot of lows during their stay, and we shared those with them," says Kim's father, Bob Kirzow, "we felt the pain as much as they did." Kim and Fred Spratt's final trip before Kim's final weeks of pregnancy took a tragic turn when her twin babies came three months early. The couple remains overseas keeping watch over Hayden after Hudson's death. The couple wanted to bring their little girl home, but initially their insurance company, Highmark Blue Shield said it would not pay for a medical transport. They appealed, elected officials helped them, and late last week, the insurance company reversed its decision, after the story aired on Eyewitness News. "People paid attention to it - this was just this past week - everything just happened within days," said Kim's mother, Donna Kirzow. The family then began their cross-Atlantic trip on a private jet from Fox Flight, which specializes in medical transport. The trip was a success - and Hayden was taken carefully off the plane. "She slept a lot, but was awake quite a bit as well," adds Fred. The family still faces a long road ahead. Hayden will have to stay in the hospital for some time - and then there's Hudson. "Their rooms are gorgeous, and they're all set up for Hudson and Hayden, and my daughter wants Hudson to be remembered," says Donna "he will be remembered. He will not be forgotten. He will always be a part of this family." As for Hayden, Fred and Kim plan to one day take their little girl back to Portugal to meet the doctors and nurses who are now considered family.